Yes folks, it is possible! One of my fanvids is a Mun/Jun triangle of angst and the very middle frame is Ana-Lucia. She's only in the video for a total of two seconds and I really wanted to change it to a frame that better described the video, so I finally figured out how to change it to a frame of Sun wallowing at the airport. In this tutorial, I'm using one of Heroes vids, but I'm pretty sure you'll get the idea. Step One: Go to YouTube and click on My Account. Step Two: Click on My Videos. Step Three: Click on Edit Video Info. b) has the best effects to attract viewers. 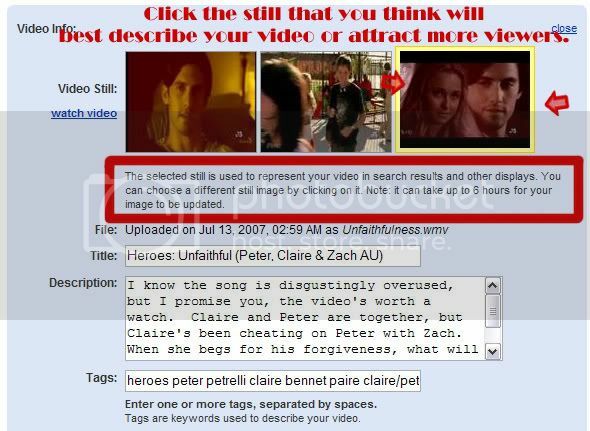 For this one, I chose the frame with the split screen and the pink tinge to let people know that it's a Peter/Claire video and that I worked hard to accomplish the effects. Remember: Don't spaz out if the frame doesn't change right away. It says that it can take up to several hours. Yeh I found this out a while ago to.